Each year, kindergartners from Grand Heights Early Childhood Center band together to give back to the men and women who put their lives on the line to keep their communities safe: first responders. The Cpl. D. Robert Harvey “Thirst” Responders Drive was created seven years ago in an effort to provide law enforcement, firefighters and emergency services personnel with one of the job’s most basic needs: hydration. Through the drive, Grand Heights students, staff and parents work to collect cases of water, Gatorade and Powerade to donate to local first responders in memory of one of Artesia’s own: Cpl. D. Robert Harvey. 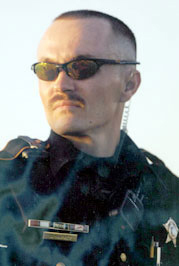 A 1998 graduate of Artesia High School, Harvey was on duty with the Lubbock County Sheriff’s Department, responding to a fight in progress call in the early morning hours of April 26, 2009, when he was struck by a drunk driver and killed. Grand Heights elected to hold their water drive in honor of Harvey, whose mother, Diana, is a teacher at the school. Volunteer Joyce Lewis is helping to organize this year’s “Thirst” Responders drive, which had its most successful year to date in 2017. While the school knows it may not be able to remain consistent with that pace, it is working diligently in the final days of the current drive to ensure as many first responders as possible benefit. The outpouring of donations in 2017 allowed Grand Heights to donate water and sports drinks not only to the Artesia Police and Fire Departments but the Eddy County Sheriff’s Office, the New Mexico State Police, Eddy County Fire Services, the Atoka, Riverside, Cottonwood, Loco Hills and Sun Country Volunteer Fire Departments, the Eddy County DWI Program, and the New Mexico Department of Game and Fish. Lewis says that not only do the individual bottled drinks aid the first responders directly, they often make their way back into the community, as well. “I know a lot of police officers I talked to last year said they like to keep cases of water in their vehicles so that if they see a homeless person or somebody out walking who looks like they need water, they can give it to them,” Lewis says. “If they’re doing searches or are at wrecks, they like to have water for those people, too. Water from last year’s “Thirst” Responders drive also came to make a difference during Artesia’s E. coli outbreaks, when bottles were distributed to local senior citizens and schools. At 1 p.m. May 10, the kindergartners will distribute the water and sports drinks they’ve collected to representatives of the benefiting agencies during a ceremony at the school. 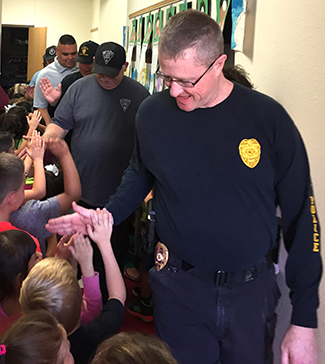 Prior to the distribution, the first responders make their way through a “High-Five Tunnel” comprised of excited youngsters eager to greet and thank them for the jobs they do. In return, Artesia Fire Marshal Brenden Harvey and his wife, Heather, will have sno cones on hand at the conclusion of the May 10 ceremony to thank students for their efforts and will also bring pizza and juice to the school May 18. The distribution is also made more special each year by the attendance of deputies with the Lubbock County Sheriff’s Department, who bring 240 cases of water to Grand Heights in Harvey’s memory. Businesses or individuals interested in donating water, Gatorade or Powerade to the “First” Responders drive are asked to drop the items off at the school by May 9 or contact Lewis for pick-up at 746-7193. Anyone wishing to make a monetary contribution or who needs a receipt for their donation may contact Diana Harvey at 746-6282.